It’s the end of the year and the final Flexibition post – either I messed up on the weekly numbering or we have an extra week in 2015. 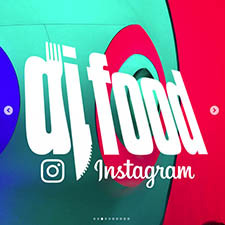 Regardless, this is post #53 and after this I’ll be moving on to something else format-wise although there will probably be additional Flexi-centric posts in the future but of a more sporadic nature. 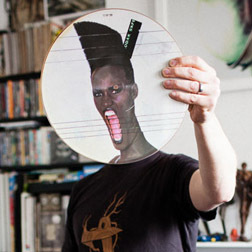 Over the year whilst I’ve been doing this people have given me discs at gigs, drawn my attention to them via the web and I’m always on the look out for odd examples so this won’t be the last by any means. A huge thank you to everyone who gave their time and dug through their collections to contribute to the collection here: Jonny Trunk, Pete Issac, Jon Brooks, Markey Funk & Ofer Tal, Stephen Coates, Jon More, John Stapleton, Steve Cook, Anton Armtone, Sarah & Leigh and Spencer Hickman. 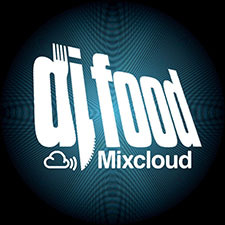 You can access all the Flexibition posts in one handy click under the ‘Site Selections’ heading down to the left of the site which will bring up everything tagged with the Flexibition label. 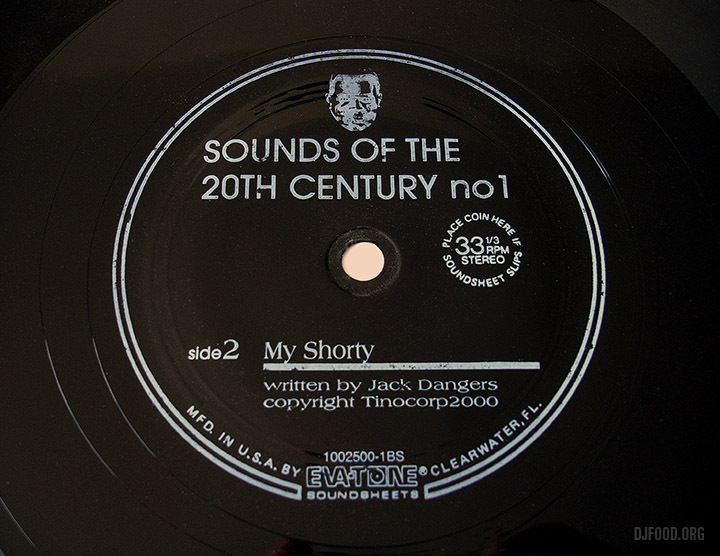 So, onto the final selection, actually five discs from Jack Dangers aka Meat Beat Manifesto and collaborators Ben Stokes and Mike Powell, all collected under the banner of ‘Sounds of the 20th Century’. 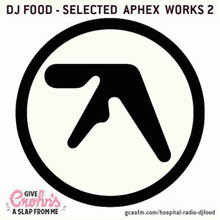 The discs, all double-sided, are spread over several different releases so pay attention. 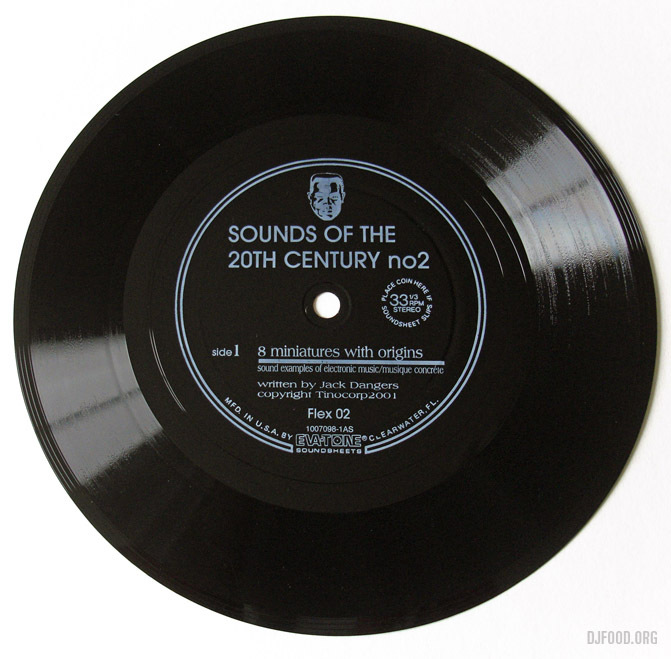 ‘Sounds of the 20th Century no.1’ was a 9″ flexi included with the Meat Beat Manifesto 12″ release, ‘Eccentric Objects’ in 2000. 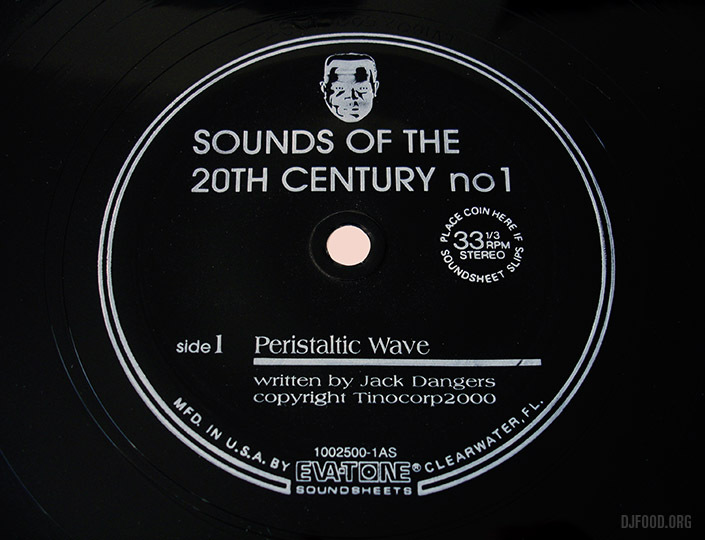 Side 1’s ‘Peristaltic Wave’ has sounds and speech from medical records whilst side 2, ‘My Shorty’, consists of shortwave radio recordings. 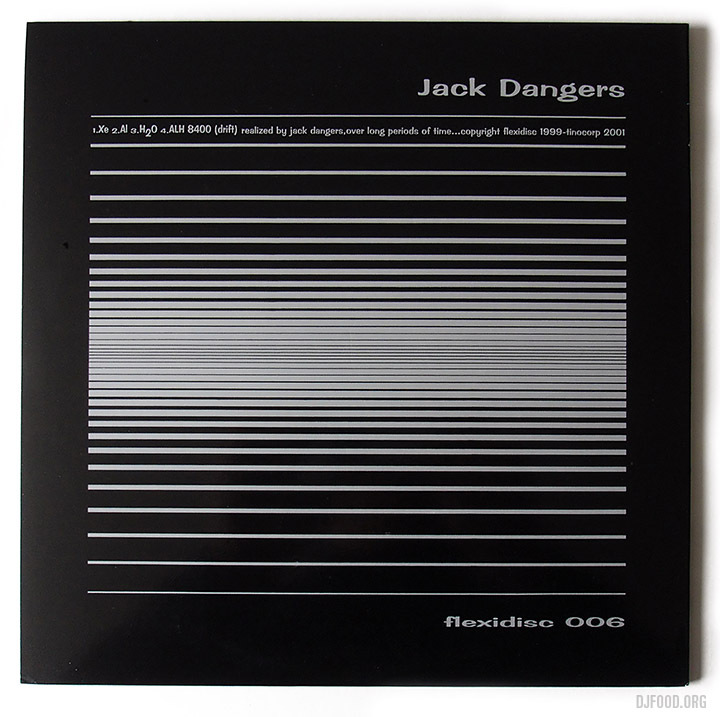 ‘Sounds of the 20th Century no.2’ was a 7″ flexi included with the Jack Dangers ‘Tape Music’ 10″ release in 2001. 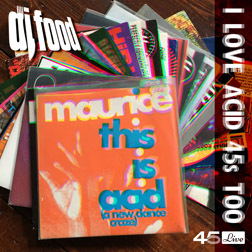 You’ll notice that the cover design is a rip of the National Geographic ‘Space Sounds’ flexi disc I featured right back at the start of the Flexibition. 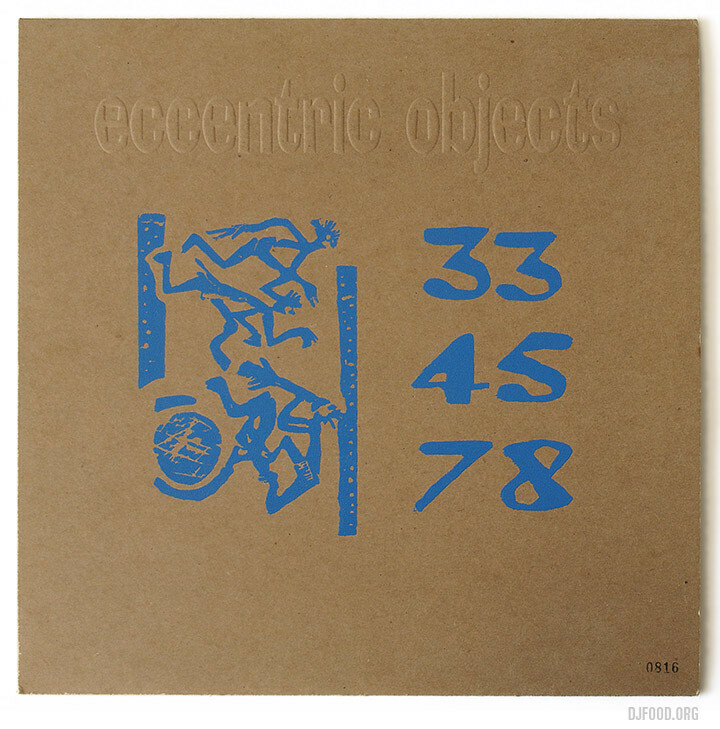 Side 1, ‘8 Miniatures With Origins‘ is exactly that, eight concrete shorts and their sources. 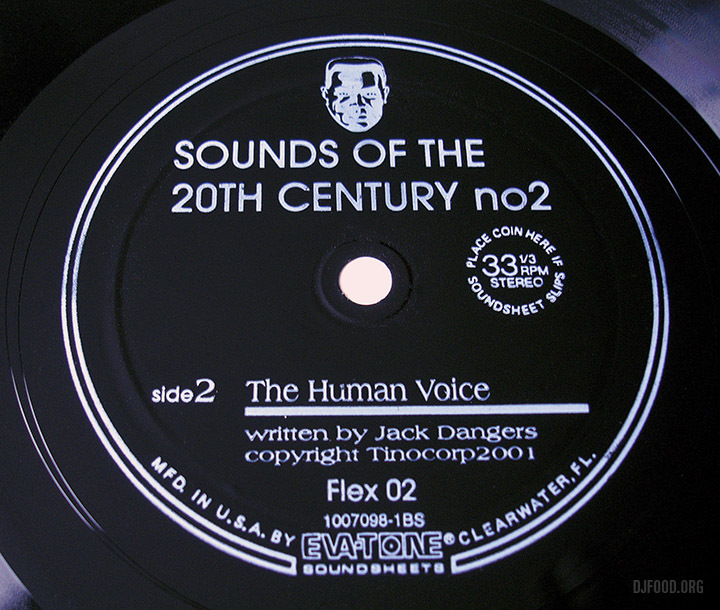 Side 2, ‘The Human Voice’, is a collection of vocal noises and speech therapy recordings, montaged together to showcase the versatility of the vocal chords, along with robotic examples. 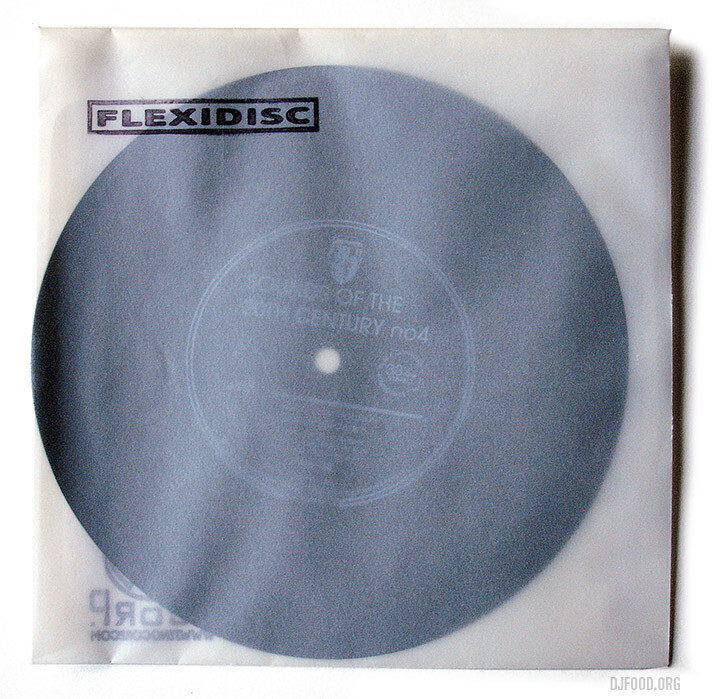 ‘Sounds of the 20th Century no.3-5’ were all included with the ‘Flexidisc’ 7″ release in 2001, a sub division of the Tino Corp. label. 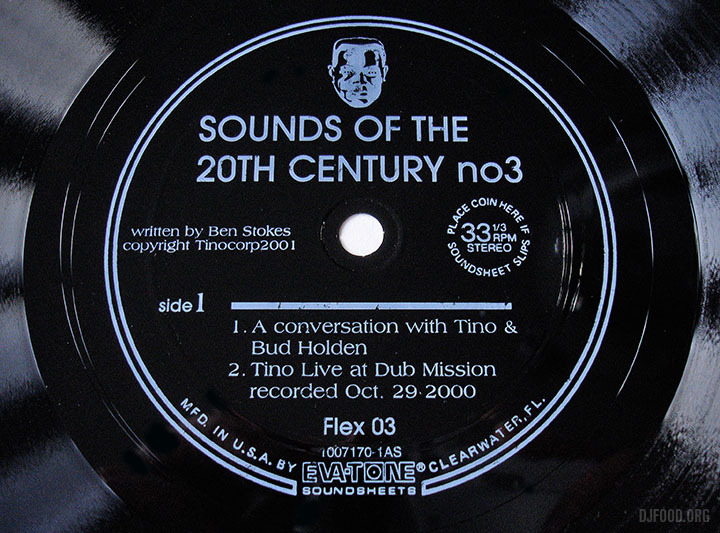 Tino is a fictitious alter-ego drummer that was used to front a series of break beat and scratch DJ albums created by Dangers, Stokes and the MBM crew and ‘Sounds of the 20th Century no.3‘ features a cut up interview and live excerpt on side 1. 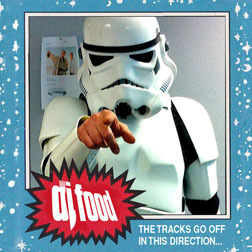 A fake Tino advert, DHS and Quintron remix of ‘Drum Buddy’, sound FX and scratches make up side 2. 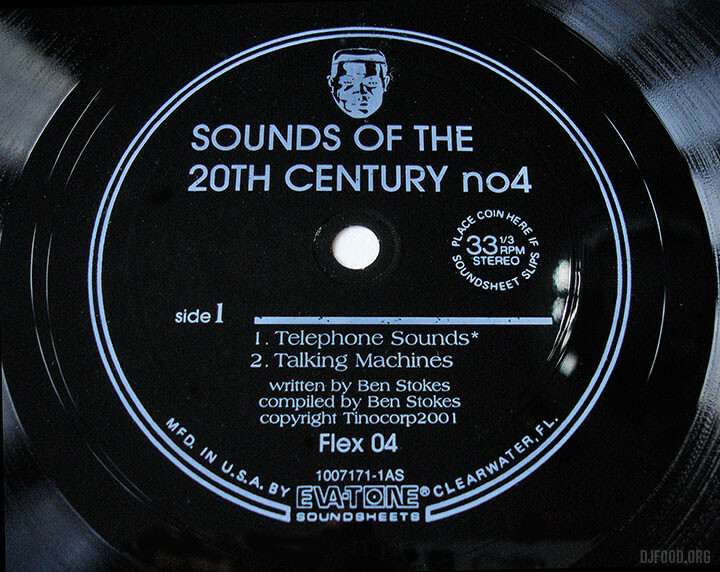 ‘Sounds of the 20th Century no.4‘ – ‘Telephone Sounds’ / ‘Talking Machines’ is again by Stokes – all switchboard operators and dial tones sequenced into an acid track which then disintegrates into a collage of voices both human and mechanical and is one of the best of the five discs. 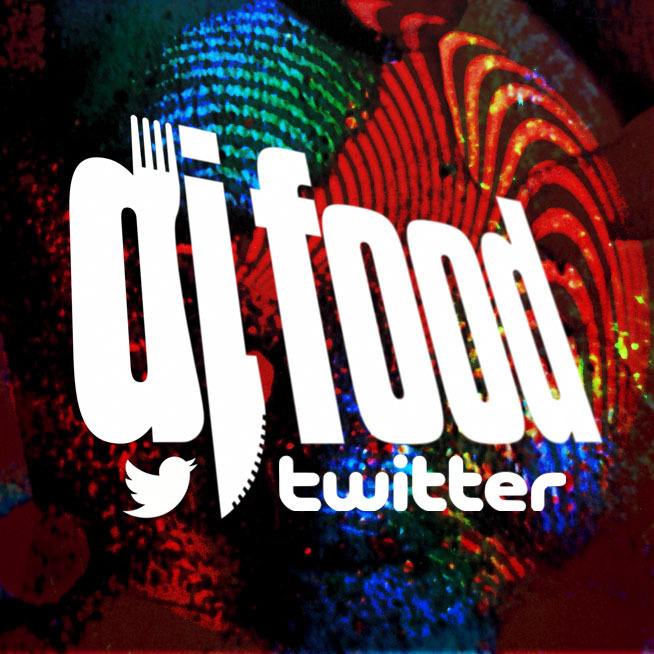 Side 2’s ‘Sounds of the Internet’ is a music concréte buzz of atmospherics, modems, static, transmissions and otherworldly sounds. 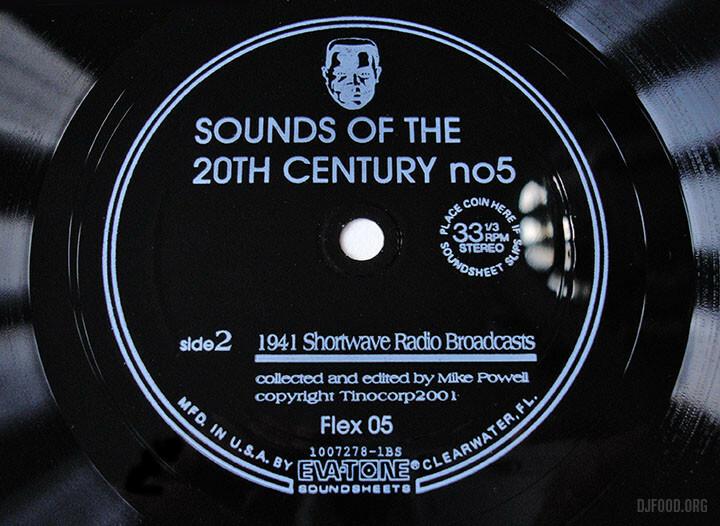 ‘Sounds of the 20th Century no.5‘ by Mike Powell is perhaps the weakest of the collection being field recordings of the Burning Man festival and shortwave radio broadcasts from 1941. All three discs are housed in a tracing paper sleeve with Tino Corp. and Flexidisc stamps on the cover and, to the best of my recollection, were sold through the MBM online shop which still has copies of 3 & 4 for $1 (for both!) 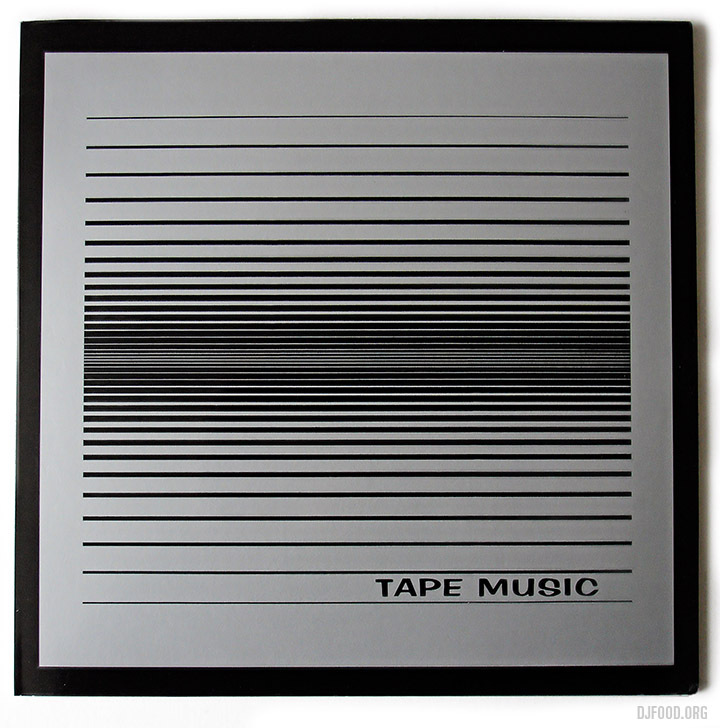 plus the Tape Music 10″ for $6.00. None of them seem to be on the web in any sonic form but, considering the price that most of them are still available for, that shouldn’t deter anyone from taking a chance on them direct from the artist. 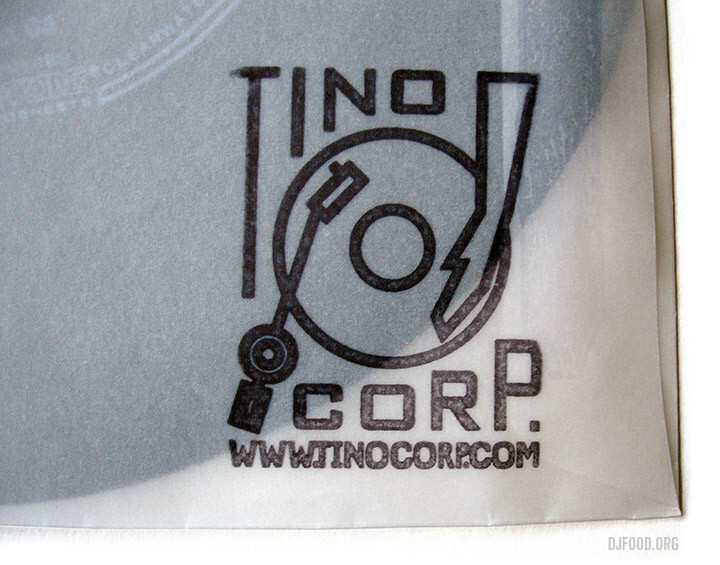 Postscript: Eva-Tone stopped production of flexi-discs in August 2000 according to online sources which would mean that these were most likely some of the last flexi discs ever made by the company.